Good evening! I hope you all have had a fabulous day! Mine was good...I played lots of catch-up in the office after being out all day yesterday. After work my hubb and I went for a fabulous run...YAY!!! I was worried after my not-so-great run on Saturday when we didn't run the full 2.5 miles that were scheduled in our training. We decided that tonight we would try to make up for it, especially since we hadn't been able to do anything the last two days with my overworking. I mapped out a 2.7 mile stretch for us close to our house that involves a looooong hill at the 1/2 mile mark all the way to the 1-1/4 mile mark and again at the 2-1/2 mile mark. I just discovered the elevation tool on mapmyrun.com...look at that hill!!! 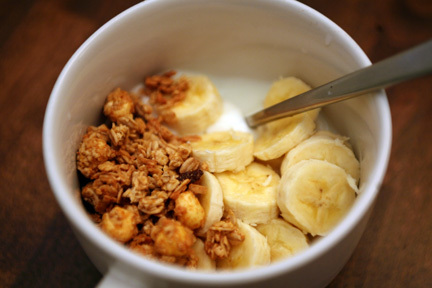 Breakfast: 3/4 cup Stoneyfield fat free french vanilla yogurt with one sliced banana and 1/4 cup of TJ's Spiced Pumpkin Granola. 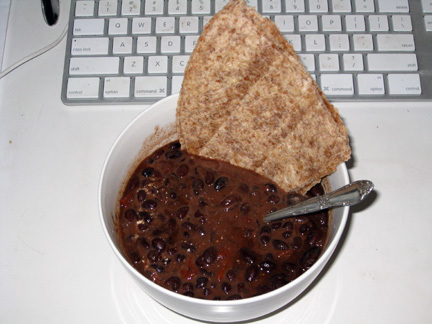 Lunch: I pulled some black bean soup out of the freezer and added a dollop of sour cream to it along with an 8" sprouted wheat tortilla. 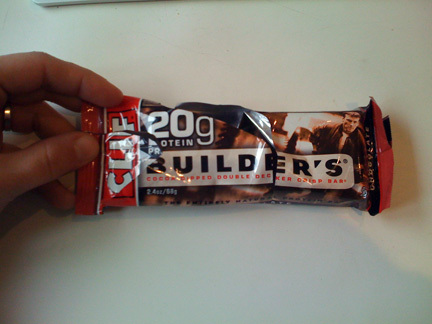 So instead I ate the other 1/2 of the Clif Builder's Bar I snacked on the other night. 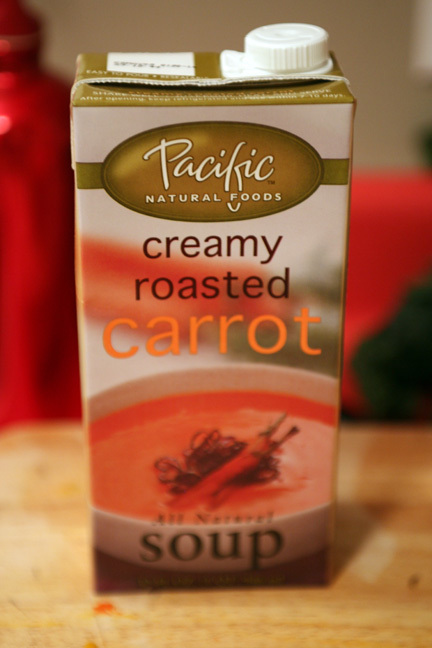 The soup was really good, but a little thick for our tastes. 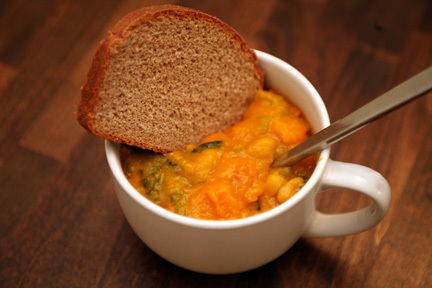 I actually had a different soup plan for the butternut squash, but when I realized that I had kale wilting in my fridge it seemed like the perfect opportunity to try out Kath's recipe. 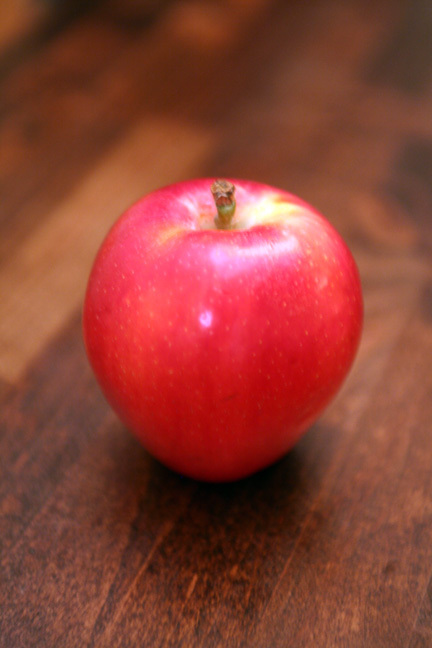 I do think I'll try my original plan next week...the hubb and I discussed it tonight and I think its going to be good! 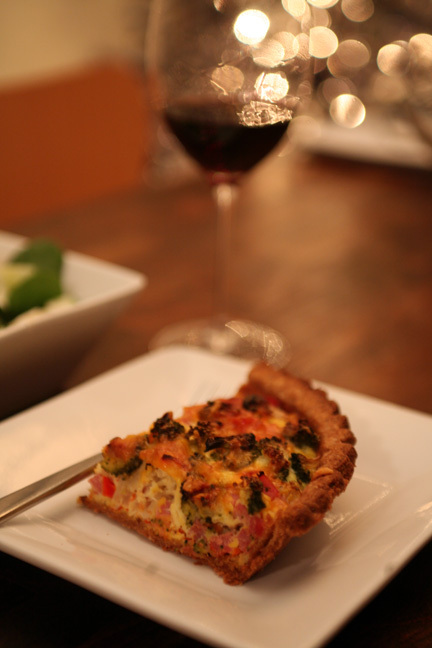 Recipe Recap: As promised, here are the recipes for the amazing dinners my Hubb made Sunday and Monday nights. They are both pretty simple, but full of so much home-cooked comfort food yumminess...! 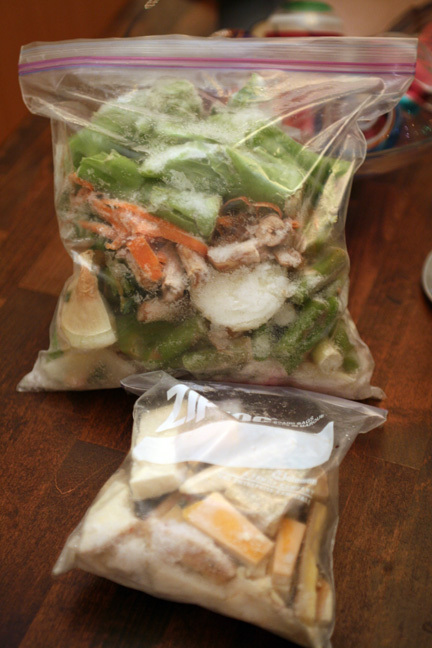 * We keep the rinds of any hard cheese we use in a small ziplock in the freezer to use for soups etc. Parmesan, parano and gouda are our most common. 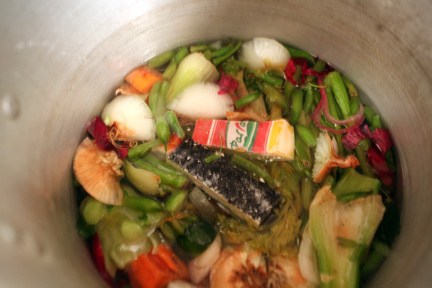 Put all frozen veggie parts and 2 cheese rinds into large saucepan or stock pot. Fill pot with water until veggies are covered. Bring to a boil, lower heat and let simmer uncovered for one hour. 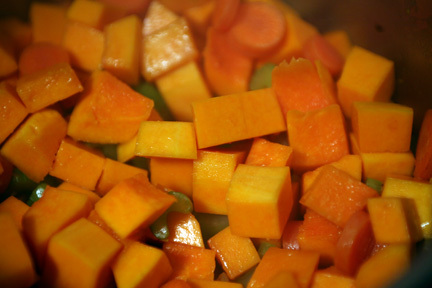 If you simmer longer you will have more intense flavor, less time will yield a milder taste. 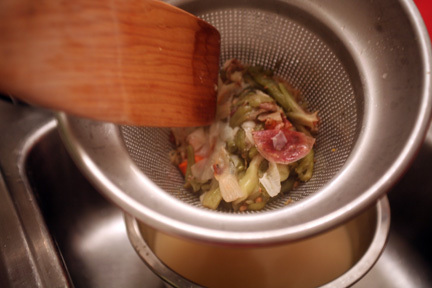 Strain liquid through a fine colander or china cap (pictured below), collecting the broth in a bowl. 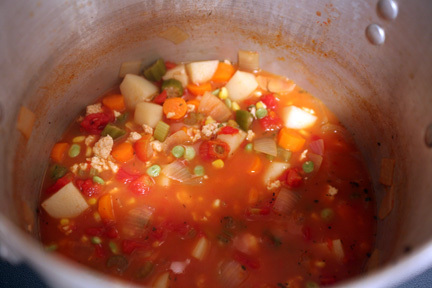 Put your broth back in the soup pot, add the tomatoes, onion, celery, carrots and potatoes and bring all to a boil. Lower heat and simmer uncovered until the potatoes are starting to soften. Once the potatoes are slightly soft, but still about 10 minutes from being soft enough to bite easily, add the frozen veggies and the chicken. When the potatoes are soft and the frozen veggies are heated through you soup is ready! 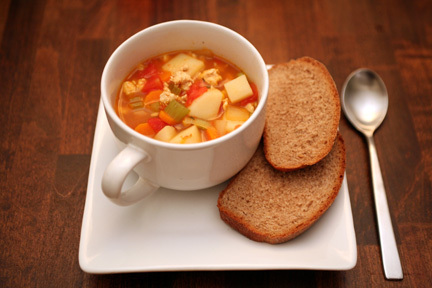 I LOVE my hubb's homemade soups....they are so incredible. We typically make the version above completely veggie and add in some barley or israeli cous-cous, but we had leftover ground chicken after making the potstickers a few nights before so decided to throw it in. 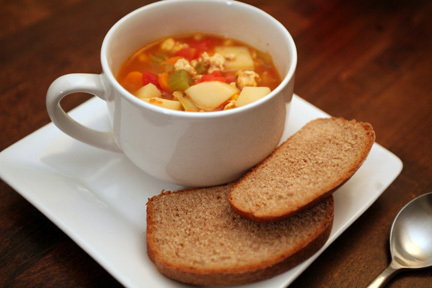 That's the beautiful thing about these soups...anything and everything can go in! And I also love that the homemade broths provide a way for us to use our veggie waste when the compost bin is out of commission during the winter. Pull pie crust from freezer and allow to thaw for 10 minutes. Preheat oven to 400*. Poke holes in the bottom of the crust, cover with foil, add pie weights (or dry beans) and bake for 10 minutes. Whisk eggs and add salt and pepper. Set aside. 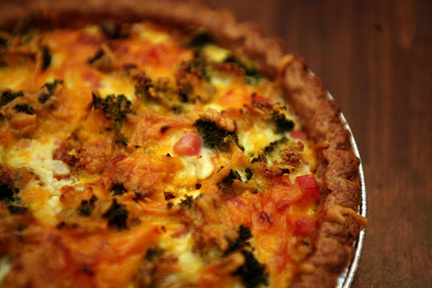 Put fillings into crust. Pour egg on top. 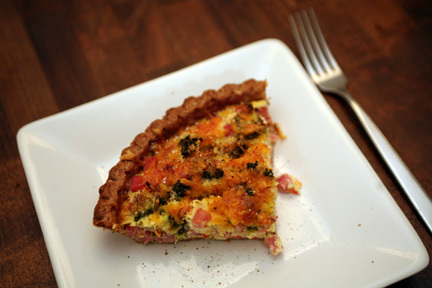 Add more egg if needed, the crust should be about 2/3's full. Bake @ 400* for 60 minutes on the BOTTOM rack of oven.